How can an X-ray help me? | Podiatry Associates, P.C. How can an X-ray help me? 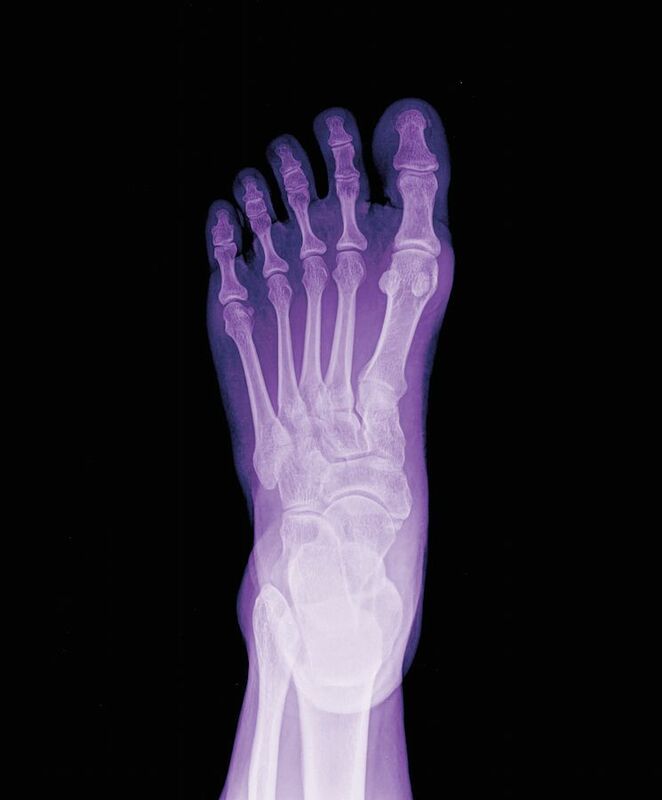 X-rays are actually very valuable tools for diagnosing painful bone problems in your feet, since they create pictures of bones that can be evaluated for problems. X-rays have been used in medicine as diagnostic tests since the late 1890s, when the rays were discovered. They work by beaming small amounts of radiation through your body tissues. These rays are received by film or digital receivers positioned behind you. Since dense tissue, like your bones, absorbs more of the radiation than soft tissue, it casts a “shadow” of sorts that gets captured on the film or digital receiver. This then creates a picture that specialists like our team at Podiatry Associates, P.C. can evaluate. Pictures of bones allows us clearly see fractures, tumor growth, dislocated joints, arthritis damage, benign cysts, and even bone damage from osteoporosis. This way we can identify your condition more accurately and help you get the treatment you need. X-rays also allow us to evaluate your recovery and make sure treatment is working. If you’d like to know more about how we use X-rays or other diagnostic images, or you need help with foot pain, call us at (303) 805-5156 to make an appointment at our Denver, CO location. We’re always happy to help!